"I remember what we did in Kuwait. I remember it perfectly. But I don't remember actually doing it." Image Transfer Review: Demme and his longtime cinematographer, Tak Fujimoto, favor very tight shots of their actors talking directly to the camera�these separate the men from the boys and the women from the girls, because if you don't have the chops to look right at us and speak the truth, we're going to know about it. It also means that the slightest imperfection or movement is magnified, and the occasional problems with the transfer are made that much more obvious. Still, it's a pretty solid job of it. Audio Transfer Review: One of the best audio mixes I've heard in a good long while—it's atmospheric and full, at times rich, frequently haunting. Demme's restrained, appropriate musical choices add to the overall auditory experience. Extras Review: Not an overwhelming extras package, but some choice bits here nonetheless. Demme and one of the film's credited screenwriters, Daniel Pyne, sit for a commentary track, a self-proclaimed mutual admiration society. They discuss the film's prescience—pre-production was well underway before the war in Iraq, giving the movie an uncanny relevance—and they're very good especially at hashing out character details and background. The actors were invaluable here, they report; Streep's instincts especially are praised as extraordinary. Pyne in particular attends to the differences between this film and its predecessor, noting that the solitaire motif, so prominent in Frankenheimer's movie, is absent this time out. The Enemy Within: Inside The Manchurian Candidate (14m:05s) is typical junkety stuff, with Demme, Pyne, Washington, Streep and Schreiber, and Tina Sinatra, Frank's daughter and a producer on this project. The Cast of The Manchurian Candidate (11m:54s) is a celebration of Streep, Washington and Schreiber, including praise from those in the first featurette along with Jon Voight and Roger Corman. A package of five deleted scenes (09m:34s) show work on a professional level, but no real gems here; Demme and Pyne provide commentary for this as well, with Demme offering an impromptu tour of Nyack, where he shot much of the picture. Streep in character sits for two television interviews (02m:39s), the second of which features Meryl trying to get her inquisitor, Al Franken, to laugh; Demme and Pyne provide commentary here as well. Liev Schreiber's intensity is very much on display in his screen test (02m:49s) with Streep. Finally, there's footage (10m:00s) of the film's political pundits—they include Roy Blount Jr., Sidney Lumet, Anna Deveare Smith and Fab 5 Freddy—talking about the general state of the nation; their voices were used as background chatter throughout the feature. Demme flies solo on the commentary on these; in truth, neither he nor his pundits have a whole lot to say here. 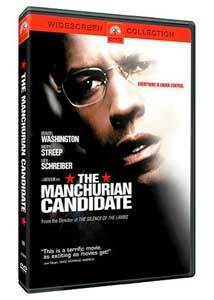 This Manchurian Candidate ably answers the question that most remakes of beloved films cannot: Why? Even if you're unfamiliar with the Sinatra/Lansbury version and are simply drawn in by the star power of this one, you'll be entertained and engaged, whether you live in a red state or a blue one.